These are stories about the spiritual journeys of our Associates. Hopefully, they will inspire you…. Grace can happen in any number of ways. Some twenty years ago, I attended a weekend retreat run by the Society of Saint John the Evangelist called “Blowing Zen: Meditating with the Shakuhachi.” Dating from the eighth century, the shakuhachi, or Zen flute, is made from bamboo root and was used as a weapon as well as a musical instrument by mendicant monks who wandered the countryside seeking enlightenment. I want to learn to play the banjo! And I still do. I guess because I’m totally focused, completely in the moment. Keeping what’s called the “bum-ditty” rhythm becomes a kind of mantra. Jamming with a group of old-time musicians, I go into a “zone,” where nothing matters but the music. At the same time, the bright sound of the banjo provides a balance in the day for someone who spends much of his time alone in front of a computer screen, often writing about grief and loss, or sitting in silence gazing at his navel (although I prefer the term, omphaloskepsis). First made from an animal skin tacked over a hollowed half of a gourd, with three or four strings stretched over a planed stick, the “banza” or “banjar” came to this country from Africa with the slaves. So the banjo has its roots in sadness and loss, which makes it appropriate for a grieving parent like me. Yet it can blossom in spontaneity and joy. In fact, I don’t think I ever knew what joy was until I began whaling away on the banjo and discovered that unlike simple happiness or contentment or pleasure, joy contains the element of sadness, of longing. I wonder if he ever played a banjo. God is a fleeting event that happens to me. It is a rising up from dull, habitual, over and over mind routine into a journey of boundlessness, abundance, safety, protection and new possibility. This protection, where no harm can come, is a place where new doorways open in my heart and there is only freshness and light. It is a place where transformation incubates. It is the gift of new direction for an old problem, of alternative ways for the worn-out emotional strategies that have carved deep ridges in me, the gift of spacious emptiness where crowded psychic clutter and dust once lived. The experience of God is the movement out of my “same old, same old” to an undiscovered path that flows like a meandering mountain stream. It is a soft landing. It is the light that stirs in my heart, breathing cool breeze into stale patterns of behavior. This gift of spaciousness is not aloneness, it is communion, “with union.” God is vibrant life where there was once stagnation. In God, my rigid, dry and brittle heart turns supple and absorbent. God is freedom to create, freedom for change, freedom to emerge. The fuel behind this momentum is mighty and mysterious, radiant love. It is a love that is barely knowable, incomprehensible, beyond understanding. It is more vast than the clear night sky and the canyons and ocean depths. It is love that is unbreakable, unmovable, unquenchable, through all time and space. This love in God is as close as my breath and a healing adhesive balm on my soul. “Never fall in love with a pot until it comes out of the final firing.” This was the first advice given to me when I began making pottery. Much can happen to a pot from start to finish. 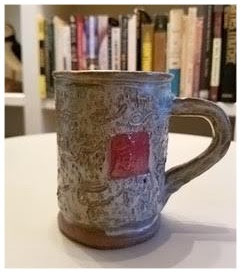 The soft clay handle of a newly created mug may droop under its own weight. Once it dries the mug becomes very delicate and may be easily broken. When the mug goes through the bisque firing it may distort. In the final glaze firing the reliably bright turquoise glaze may turn into a dull gray or may run off the mug and cause it to stick to the kiln shelf. Or the funny little distorted gray mug with the droopy handle may turn out to be your favorite piece. Making pottery is a spiritual experience for me. It is about earth and fire and also about being present. Playing in the clay, or mud, helps me feel close to the earth. It forces me to clear my mind and concentrate. It teaches me to get out of the way and let the clay tell me what it wants to become. Making pottery has helped me learn to not get too attached to results and to remember that handcrafted pottery is not supposed to be perfect. (There is more about my wabi sabi imperfect pottery on my website, Art Studio No. 8.) “Quit trying to be perfect” is the best spiritual lesson I have been given. I learned it from mud. When I was four years old and living in Americus, Georgia, a large black Buick hit me as I was crossing a road and dragged me for a short way down the street before the driver realized what had happened. During the time I was unconscious, I experienced a lady with long silver hair, who I have recently named Emily, walking with me among a group of children from all over the world. I felt warm, loving, joyful, even gleeful, as we all romped in a beautiful meadow. Since that near-death experience, I have always felt totally at home in my backyard as well as in the wilderness. One day many years later, I was walking in another meadow near the horse farms of Ocala, Florida. As I strolled along, I felt questions coming up from the trees and plants. This meadow, along with these questions, formed the basis for a labyrinth I was soon to design. 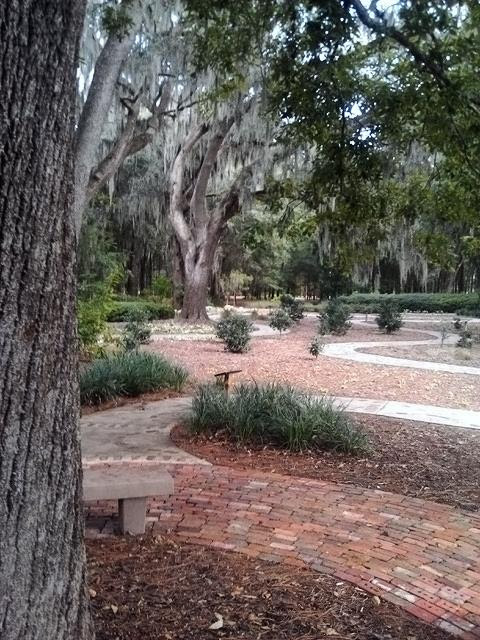 For a number of years, I took local retirees on ‘Friday Walks” along this labyrinth, inviting them to gaze with soft eyes upon all of the nature that surrounded them. I asked them to write in their journals questions that came up inside their hearts. We would later gather up under a tree and listen as each shared how nature had invited them to go inward. My wife, Heather, and I were later married in the center of this labyrinth, held within the loving arms of a huge hickory tree. studio that Heather has blessed with her loving gifts of design, art and gardening. with Heather’s landscaping skills adding beauty to an already incredible space. is good to have a place and to feel that I belong within it. Where is it that you feel questions rising up within you that beg for a fresh new answer? I once heard the voice of God. It came from the back seat of my car, as I approached the York Toll booth. I heard, “whichever way you go, I will be with you.” Now to be clear, this did not involve a prayer on my part asking which lane in the toll plaza would be the fastest. I was struggling to decide a course of action regarding my marriage. Hearing God’s voice did assure me of a companion and my spiritual background told me my companion was a kind, loving one. I have recalled that voice assuring me of God’s presence and approval many times in the years since. Sometimes I forget the voice and get called up short when I do remember it. I have taken many opportunities to share with others my story of God’s presence and healing. Sharing the voice from the back seat has become my passion. 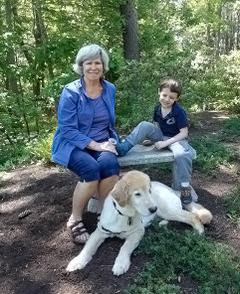 Photo caption: Marty with grandson Eli, who had a broken leg, and grand dog Maya, who adores chasing a ball at the beach! As a seminary student, I spent a considerable amount of time treading water in the theological deep end, trying to understand God’s proximity in loss and the meaning or purpose of suffering. As you might guess, this was no intellectual exercise. In 1967, the wrongful death of my three-year-old sister, a consequence of parental neglect, unleashed a torrent of events that sent my older brother into a death spiral of addiction that took his life twenty-five years later. Karen’s senseless death broke Phillip’s story. And mine. I struggle to live comfortably from my heart. My connection to all things holy feels tenuous much of the time. The slow process of healing plods along. At age sixty, I’m still relearning the world as it is now; not as it once was, nor how I wish it could someday be. There’s no triumphant ending here. But remarkably, through no effort of my own, the center still holds. Have you ever walked into a kitchen and discovered the delectable fragrance of marmalade, chutney, jam, or preserves cooking? 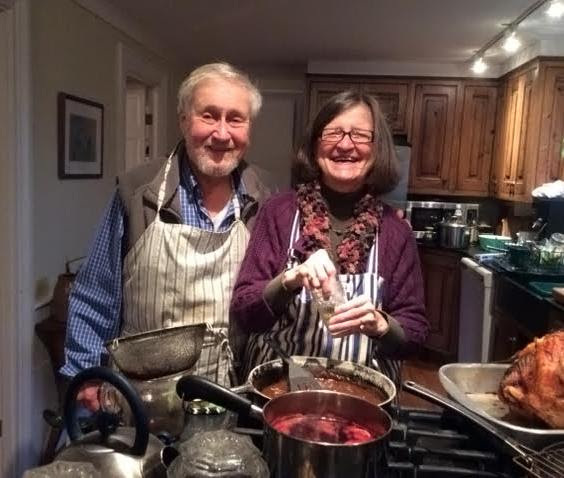 Forty-some years ago I had that experience entering the kitchen of a friend, who then taught me the process which gave birth to my passion for preserving. Over the years, I have become aware of the inherent spirituality of that process. Yesterday I stood beneath an apple tree, and was awed by the abundance of attractive apples, which I could just touch and pick! I’ve had similar experiences with cherry, peach, pear, plum, and quince trees, not to mention blueberry, currant and gooseberry bushes (in Pennsylvania), grapevines, and rows of cranberries, rhubarb, and strawberries. Such varied and beautiful abundance of creation, gifts right there for me, my husband, daughters, and grandchildren to pick and enjoy! As we bring our harvest into our kitchen, I consider which recipe to make, sorting through recipes from family, friends, and books. As I decide, I evoke that person or author and silently give thanks for the recipe which means so much to me. workers?) who grew, harvested and/or prepared the ingredients have been well-treated. I hold them in prayer—as well as their/our government(s). labels, and I am filled with gratitude! Discovering this small initiative called the Northeast Guild for Spiritual Formation about fifteen years ago was an answer to a prayer for me. Since completing the Shalem program for Spiritual Guidance in 1999, I was hungry to learn more about the spiritual life and expand my relationships with like-minded spiritual seekers beyond my local community. Being able to participate in Guild programs on Mount Desert Island and stay at the Alcyon Center have deepened my spiritual awareness. I have been fortunate to take part in in many overnight times of Teaching and Retreat, and my prayer practice has deepened as a result of these opportunities. The Guild is also an excellent resource for new books and other resources that keep me abreast of the spiritual world. I have also appreciated the Alcyon Center’s hospitality for times of simple rest and personal renewal. The Guild stretches beyond Mount Desert Island, bringing deepening opportunities to my local community in Brunswick. I became an Associate when Jeanne Tuttle and I began to offer a bi-monthly Quiet Day at my house. Jeanne and I also served on the Guild Spiritual Life Table and attended meetings with the Board of Directors. I receive loving encouragement and guidance for my small practice of Spiritual Friendship with several directees, and support for our local Peer Group Supervision group. Here in Brunswick, we also have a bi-weekly time of Silent Prayer which is open to all who wish to participate. In addition, a time of prayer and reflection is available via ZOOM for those who find it difficult to get to Mount Desert Island or who desire more frequent contact. My time with the Guild has gone by quickly and my years are reminding me of the need to be less active. However, the Guild still has much that I will be able to take part in locally, such as contributing financially to the work of the Guild, praying for the Guild and its Associates, using resources suggested in the Newsletter, and participating in offerings locally and on the Internet. For example, Dennis Kiley’s online presentation this summer of an ecospirituality initiative “Nature Inspired Spirituality” will feed me for the rest of my life.